I recently had an answer downvoted and deleted for not directly answering the question. Whilst I can see the argument that it does not constitute a good answer, I still feel that it was constructive and helpful to finding an actual solution to the issue, and the information I posted would not have fit well in a comment. What's the balance here between providing helpful information and strictly complying to the SO guidelines? How should I have correctly conveyed this information to other users? Posting the code sample on an external site and linking in the comments seems appropriate, but feels to me like a failure of SO to provide adequate tools for helping users. This technique is borderline acceptable, but it should be clarified that the answer is "not a complete answer" and will be deleted/edited once more information is supplied. It's indeed too much to post as a comment, but from what I can see you didn't add any information that isn't already in the question. In that sense, a comment along the lines of "I'm unable to reproduce this." is enough. If nobody is able to reproduce the behaviour, the question can also be closed with "This question was caused by a problem that can no longer be reproduced". It may be that the question is omitting some code detail that makes the difference. In a similar discussion at MSE, people seem to agree that "works for me" and the like are Not An Answer: Are "works for me" answers valid? There is some support though for answers like yours, if you include details like interpreter and version, operating system, working directory, CPU architecture. But I still wouldn't rule out the risk of having such answers deleted. Indicating at the top that it's not a direct answer, but indicated why I've used the answer box - I.e. it's far too large for a comment, I need to apply formatting etc. Indicate at the top that I have marked it as community wiki and I'm perfectly happy to delete it once the question asker has either dismissed it as irrelevant or absorbed required parts into their question. If your primary concern is with making it easier for others to replicate the answer, then edit the code to replicate the issue into the question (with clear mark that it is not from the OP). Technically the OP should be providing that already, after all. 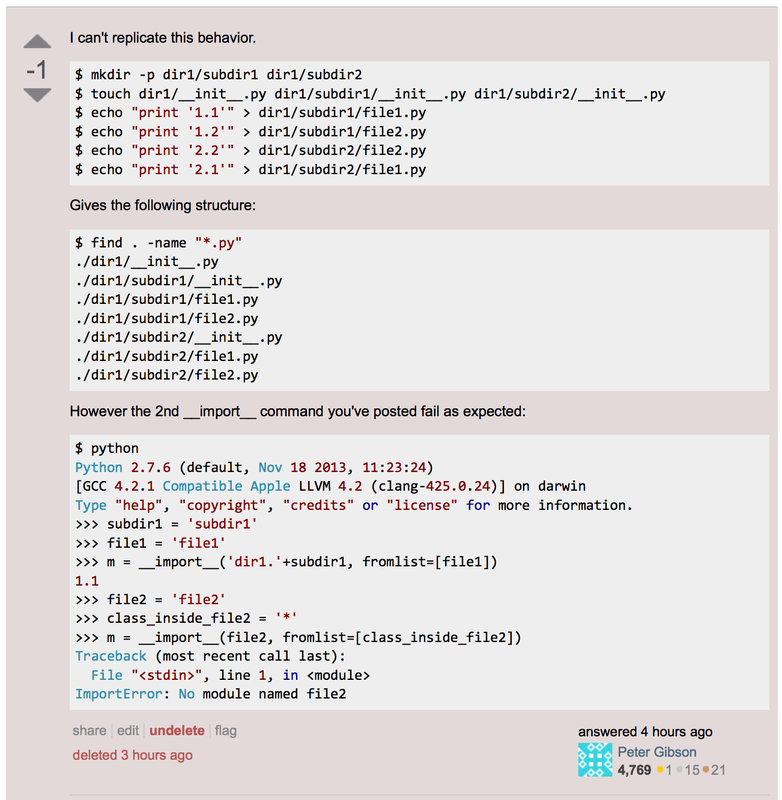 Then you can easily just comment "I cannot replicate given the above code". The balance at Stack Overflow is too much in favor of complete answers, and against part answers or even helpful leads. What's wrong with allowing a complete answer to be created in stages? - Rather than never. A part answer gets me closer to a complete answer than no answer at all. There is 1.7 million reasons to support this claim. 1.7 million questions without upvoted answers (20%), that could become helpful to seekers if partial answers of even useful leads were allowed as responses to the question. So often I find that the only questions that relate to my problem have no answers. Not to mention the upvoted answers that could be more useful with more information associated with them. Additionally, more often than not, when im searching for solutions to my problems, Stack Overflow complete answers are just a part answer to my particular problem. So actual part answers are usually going to be just as useful to me. How about a menu that lets users choose between "Answer", "Alternative strategy", "Suggestion"? "Answer"s get grouped at the top. Why are (long) comments posted as answers being flagged as “low quality”?